Whether you're looking to sell your home, or are just interested in making improvements that offer ROI, an outdoor living space is a great investment. The Outdoor Power Equipment Institute (OPEI) shares the top four ways family yards and other living landscapes add value to a property and extend the usefulness of the home. Curb appeal. As you know, curb appeal is an important factor in determining overall property value. After all, the first impression on a home is made before buyers even walk through the door! According to the National Association of REALTORS® (NAR) 2016 Remodeling Impact: Outdoor Features study, 99 percent of REALTORS® have suggested that sellers improve their curb appeal before putting their home on the market, and 98 percent think curb appeal is important to potential buyers. That’s good advice. Studies show that improving overall curb appeal, which includes a beautiful lawn and landscape, can boost property values by as much as 17 percent (source: Texas Tech University). Win with trees. Mature trees are often an indicator of an established neighborhood, which can be a positive for buyers looking for an older, classic home. But the value of trees goes beyond perception and preference and right into your pocketbook. According to the International Society of Arboriculture, each front yard tree adds 1 percent to a homeowner’s sale price, while large specimen trees can add as much as 10 percent to property values. Green. Potential buyers often ask about the energy efficiency of a home, and it turns out that living landscapes impact the monthly electric bill. According to the Urban Forest Coalition, 100 million mature trees around U.S. residences save approximately $2 billion annually in reduced energy costs. In fact, strategically placed trees can save up to 56 percent on annual air conditioning bills. In the wintertime, evergreens that block winter winds can save 3 percent on heating (source: U.S. Department of Agriculture, Forest Service). Cumulatively, eight average-sized front lawns can provide the cooling equivalent to air-conditioning for 18 homes (source: Alliance for Water Efficiency). Living space. Yards can be outdoor family rooms and are increasingly important to families who want a safe, inviting place for their kids and pets to play almost year-round. Merging indoor and outdoor living to increase living space is trending, making outdoor living space important for homebuyers. But just how much can you expect to recover from ensuring a useful outdoor living area? According to NAR survey, any cost to enhance outdoor living is well worth it. Seeding the family yard will recover 417 percent of the project cost, while updating landscape with sod will result in a 143 percent recovery. 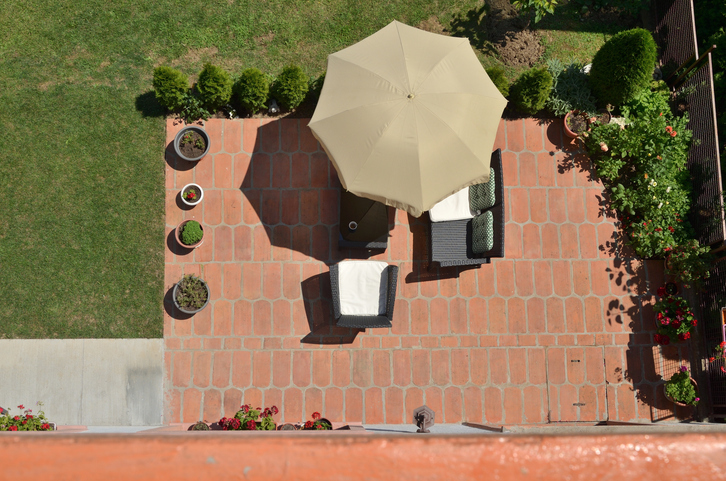 If you want to take on more of a project, adding a new patio will recover 102 percent of your investment and a new wooden deck will result in a 106 percent recovery rate. One final note: a systematic research review concluded that knowing and experiencing nature makes people generally happier and healthier. Since nature starts in our own backyards, it’s fair to assume that the family yard contributes to overall well-being. This is priceless, whether you are looking for a new place to call home or are just settling in to your new property.